A blog begun by Deacon Clay Calhoun that features reflections on the "Red Letter Days" in the Episcopal Calendar. These days are feasts that commemorate, in varying degrees of solemnity, different holy persons, places, or events that play a great significance in the life of the faithful. The blog provides an opportunity for members and non-members of the Church of the Holy Apostles to grow in their knowledge and love of God. 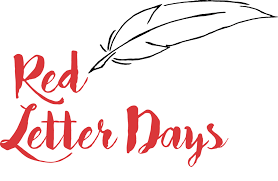 Click on the title "Red Letter Days" to go to blog.